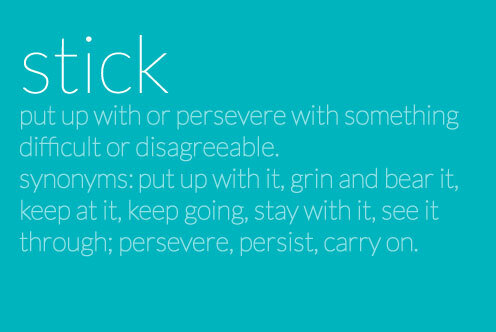 What does sticking to something mean to you? Tonight as I did some downward dog yoga action with my trusty iPhone yoga app at home, and muscles began to tire and shake, my promise floated through my head. And I stuck with it. I mean, really, no one was watching so I could stay in Child’s Pose a little longer if I wanted. I could skip the next flow if I desired. I could just quit early too. But I made myself stick it out. I dug a little deeper. Instead of counting the minutes I fully threw myself into each pose. Each one giving me another chance to reach peak performance. It’s a good reminder to me, and maybe something I will continue to learn more about as this peak performance year unfolds. When we do what we love, we prosper. When we love what we do, we live. When we’re totally engaged, everything is engaging. ← 2014 BLOG – DAY 2 :: new year: what’s your goal? I want to stick with you!